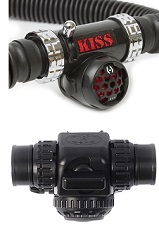 At New Zealand Sea Adventures we offer you all essential support related to KISS Rebreathers. You can buy one from us and receive your training from us as well. This fantastic machine comes in two forms – Spirit LTE and the Classic (the Explorer is a variation of the Classic). Both are depth rated to 91m. Their time limits are 2.5 hours and 4.0 hours respectively in temperate waters and longer in tropical waters. These are really safe and simple re-breathers. Shearwater Dive Computers Rebreathers – the biggest decision.. The KISS Classic is a strong, reliable and adaptable re-breather which is designed for both recreational and technical diving. Wreck, deep, cave, shallow reef, photography, the Classic KISS does it all in one clean, easy to use, well priced package. The Classic follows the traditional CCR design and has both the diluent and oxygen cylinders integrated into the back mounted unit. The bail-out cylinder can be plugged into the BOV via a hose and quick release assembly. Scrubber duration is 4 hours in 4-17 degrees C and 5 hours in warmer water. The unit is rated to 91m but your initial maximum depth is 30m on air diluent. The Classic can also undergo an approved modification and be dived deeper than 91m (with suitable training). Once you have the CCR Trimix pre-requisites and training, you may change your diluent gas to trimix and start going deeper. I bought my Shearwater multi-gas computer to interface with my KISS Classic re-breather. However quite often I dive it using SCUBA. When I compare it to previous multi-gas computers I have owned I am amazed. Switching gases above or underwater is the easiest I have experienced. The Petrel 2 can be programmed for 5 OC and 5 CC gases. All functions are controlled by two touch buttons. These are reliable and can’t jam. The Petrel 2 has a lot of menu functions, but there are very few you need on each dive. The process is easy as the menu is scrolled by one button and is selected by using the other button. It has big graphics and is easy to read under water. It is back lit and that brightness can be controlled. I was diving deep, using trimix and doing two gas changes and knew instantly which gas was which. The battery is user replaceable, and you can choose from several different types. The electronic compass is a real must for the Rec and Tec diver. The switch from OC to CC is really easy. It monitors the CCR oxygen sensors by cable, or it will calculate deco using a set PPO2. Any data that appears incorrect to the computer will result in that data being highlighted in bright colours. All data is very easy to read. Decompression obligations show: CNS, ascent rate, TTS, stops and time required. Warnings are flashed! Download is via Bluetooth. The Perdix comes with or without an air integrated function. The AI function will allow you to monitor your gas duration based on your current depth and breathing rate. The Perdix does not come with a Fischer connector so cannot be used to monitor actual PPO2s on a CCR. It can however be programmed for a fixed CCR PPO2. The Perdix has identical firmware and features to the Petrel 2 including the compass. Improved functions include: double O rings on the battery cap, integrated bungee mount holes, lower profile but has improved colour display and 30% longer battery life. Now we have the ultimate Heads-up-display as well. Shearwater have produced the NERD (Near Eye Remote Display), a fully self contained CCR HUD. It attaches to your CCR head by Fischer cable and has a user replaceable battery.At eye level you get real data such as PO2, CNS, depth, time, gas, required stops and deco obligation. This image is like reading a Petrel that is about 36cm (1 ft) away. The Perdix has identical firmware and features to the Petrel 2 including the compass.This is a great tool for safe diving as it gives you hands free eye level monitoring. If you need a more conservative reading, these computers will allow that. Ideal set-up is a NERD at eyelevel and a Petrel backup on the wrist. These are the computers to take you safely into CCR tech diving – and get you safely back home again.